It's been more than 20 years, but ESPN's "This is SportsCenter" is still going strong. 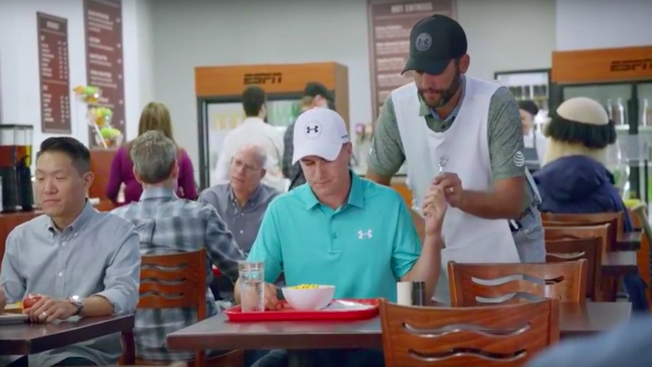 In Wieden + Kennedy New York's latest work for the classic campaign, pro golfer Jordan Spieth brings his caddie, Michael Greller, to the network's cafeteria for advice—not on which club to use but on whether a fork or spoon is better for eating a bowl of mac and cheese. It's a fun little gag, and yet another solid extension of the campaign's broader premise of peeling back the curtain on the (sometimes weird and obsessive) personalities of star athletes and newscasters inside the SportsCenter offices. So the work scores extra points for the meta crack on sports commentary as a genre: Sometimes, the ad seems to say, it may well be like listening to someone deliver a blow-by-blow on how to chow down on a microwaveable meal.